Unemployment in California has dropped to its lowest level in nearly five years, with Bay Area counties reporting the smallest jobless rates anywhere in the state. California’s unemployment rate fell to 8.6 percent in May, down from 9 percent in April and 9.4 percent in March, according to seasonally adjusted numbers from the state Employment Development Department. And the news was even better in the Bay Area, where jobless levels ranged from 4.5 percent in Marin County to 6.8 percent in Alameda County. 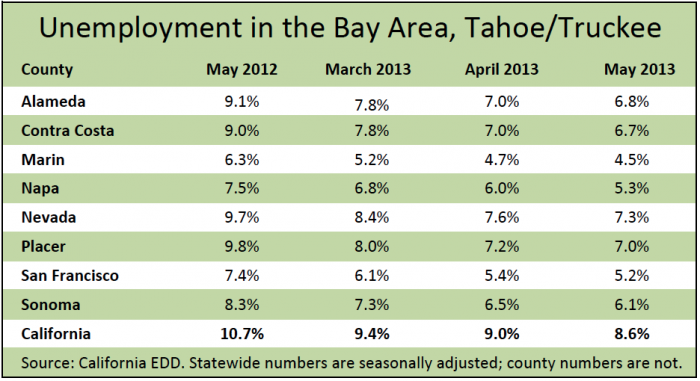 Unemployment numbers in the Tahoe/Truckee region were also well below the state average: 7 percent in Placer County and 7.3 percent in Nevada County. The statewide jobless rate is currently the lowest it has been since October 2008. Low unemployment is a key sign of economic growth and a big factor in helping to boost buying power in real estate markets. In a report analyzing the EDD statistics, economist Stephen Levy said the Bay Area — aided by the region’s many cutting-edge technology firms — also led the state in job growth. The Golden State added 100,000 new jobs over the past year, according to Levy, and the news is just the latest in “a flurry of good news about the California economy. “Real GDP growth in California in 2012 was 3.5 percent, tied for fifth highest in the nation,” Levy said. “The Department of Finance reported that income tax receipts were $500 million above expectations in May, and the California Association of Realtors reported another month of strong gains in median home prices.